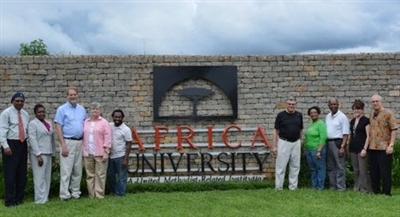 Representatives of the Florida Conference toured Africa University in February. Left to right are Michael and Sharon Austin, Bishop Ken and Pam Carter, Derrick Scott, David Dodge, Paulette and Walter Monroe and Icel and Armando Rodriguez. Photo courtesy Rev. David Dodge. Editor's note: This article was updated March 25, 2014. LAKELAND – Efforts to engage young adults in the mission of God and develop leadership skills both here and half a world away will receive a boost from monetary giving at this year’s Annual Conference, scheduled for June 11-14 at The Lakeland Center. Half of the donations collected before, during and in the weeks following the annual business meeting of clergy and laity will go toward scholarships for students at Africa University in Zimbabwe, said Bishop Ken Carter. The other half will help kick-start a new intern program for young adults willing to serve in selected communities in Florida. “Our generosity through the Annual Conference offering will transform those who are equipped as servant leaders, both on the African continent and in our own state, and also those who will be blessed by their witness,” Carter said. Also known as the “bishop’s offering,” the annual giving ministry netted nearly $130,000 in 2013, according to the Florida Conference Financial Services office. This year’s Annual Conference theme is “The Mission of God.” Information about the meeting is being continually updated and is available at www.acflorida.org. Rev. 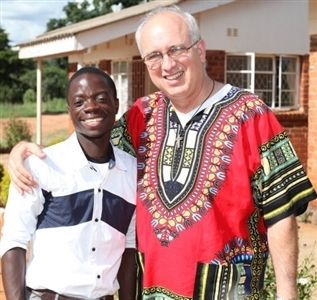 Armando Rodriguez Jr., chairperson of the East Angola-Florida Partnership, visits with Salvador Chicosseno, a student from the Florida Conference-supported Quessua Mission in Angola now studying at Africa University in Zimbabwe. Photo courtesy Armando Rodriguez Jr.
Last fall, the Florida Conference kicked off a drive to increase its support of Africa University, a United Methodist effort that provides higher education and opportunity to students who otherwise would not be able to afford it. The university was founded in the 1980s to serve students in need from across the continent. The scholarships to be funded through the bishop’s offering would go to students in the university’s Institute of Peace, Leadership and Governance and the School of Theology. Several Florida Conference leaders, including the bishop and his wife, Rev. Pam Carter, visited Africa University in February. Also on the trip was Rev. Dr. Walter Monroe, South Central District superintendent, and his wife, Paulette. Monroe, in a phone interview this week, said he and others from the Florida Conference sat in on a class and interacted with students from many parts of Africa, a vast continent that has seen its share of culture clashes and turmoil over the years. The mix of people of different genders and races in the Florida delegation was not lost on the students, who commented on it, Monroe said. Monroe said he noticed that nearly half of the students were women, an impressive statistic given that many African cultures do not encourage women to seek educational opportunity. The experience made him gratified to be part of a connectional church, he said. “When we are supporting Africa University, we are supporting our brothers and sisters in other parts of the world that do not have the opportunities we have in this country,” Monroe said. Closer to home, Rev. Clarke Campbell-Evans, director of Missional Engagement for the conference, has begun meeting with a design team to develop a program called “Young Adult Missional Movement.” The new initiative will receive half the funding from this year’s Annual Conference offering. “We see this as an opportunity to equip these young adults to be the Christian leaders of the future,” Campbell-Evans said. 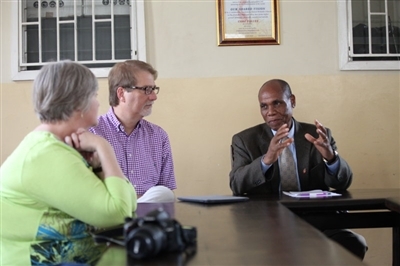 Bishop Eben Kanukayi Nhiwatiwa of Zimbabwe, right, discusses needs at Africa University with Bishop Ken Carter and his wife, Rev. Pam Carter, of the Florida Conference. Photo courtesy Armando Rodriguez Jr. The new program is being developed as an additional opportunity to the conference-supported summer intern program and interns assigned by the General Board of Global Ministries, Campbell-Evans said. Details are being hammered out, but the plan calls for three sites to be chosen in the Florida Conference area and up to 12 young adults selected for yearlong mission projects. Ideally, Missional Movement applicants will have completed at least their sophomore year of college and would be welcome to serve for a year as a break from their studies or after they receive their degree, Campbell-Evans said. The target pool of applicants is expected to be age 30 or younger, and young people of all denominations are eligible, he said, but recruitment will be through United Methodist churches. Those selected would receive a stipend that would include funds they raise themselves, along with support from the conference and the ministry site, Campbell-Evans said. The idea is loosely based on communities formed by various religious orders in which participants join together to adopt goals and daily procedures for a group, and those practices can vary according to each mission site. The program will be assigned a staff member to shepherd it through its infancy and anticipated growth, Campbell-Evans said. Eventually, the conference hopes the program will be self-sustaining and attract up to 40 young adults assigned to multiple communities in Florida. Those who wish to contribute to the Annual Conference offering can make checks out to the Florida Conference Treasurer, write “2014 Bishop’s Offering” in the memo line and drop them in the Sunday offering at their local church or mail them to the Florida Conference Treasurer at 450 Martin Luther King Jr. Ave., Lakeland, FL 33815.